How many people can go up in the airship at once? The airship is a four-seater craft, including the pilot's seat. Therefore, it has enough room for the pilot and three others. How frequently does the airship fly? The airship flies about once a week when there is a large event or charity offering taking place, dependent on weather conditions. Because the airship is sensitive to hot climates, it remains grounded during the hot summer months from late May to Nov/Dec. How high does the airship fly? The airship typically hovers at about 1000 feet above ground. Where does the airship take off from? The airship takes off from five different points throughout the valley. However, it can take off from any field or air strip. Who flies in the airship? 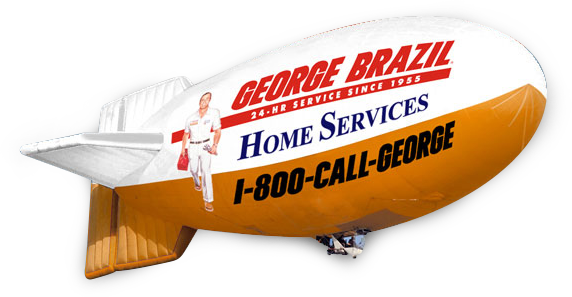 At George Brazil, we like to offer rides for 2 passengers at a time, to our employees and local charities. How did the airship come about? Please read our extended timeline of airship history: "The First Flight - History". How long does it take to inflate the airship and prep to fly? The preparation for any flight is approximately 45 minutes, for anywhere from 45 to 75 minutes of airtime, depending on weather conditions.